Hello hello! It's been almost a month since my last post and I apologize... I've been gone for more than 3 weeks, travelling to the Canadian West Coast as well as touring Alaska (trip posts to come ;). 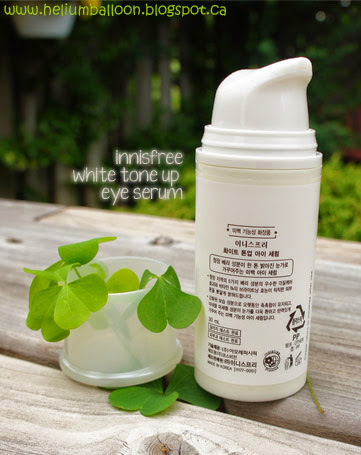 Today I will be reviewing the innisfree White Tone Up Eye Serum I've been using for the past month or so. If you have dry under-eye areas, fine lines, puffy eye bags or dark under-eye circles, keep reading to see if this serum is the right fit for you. 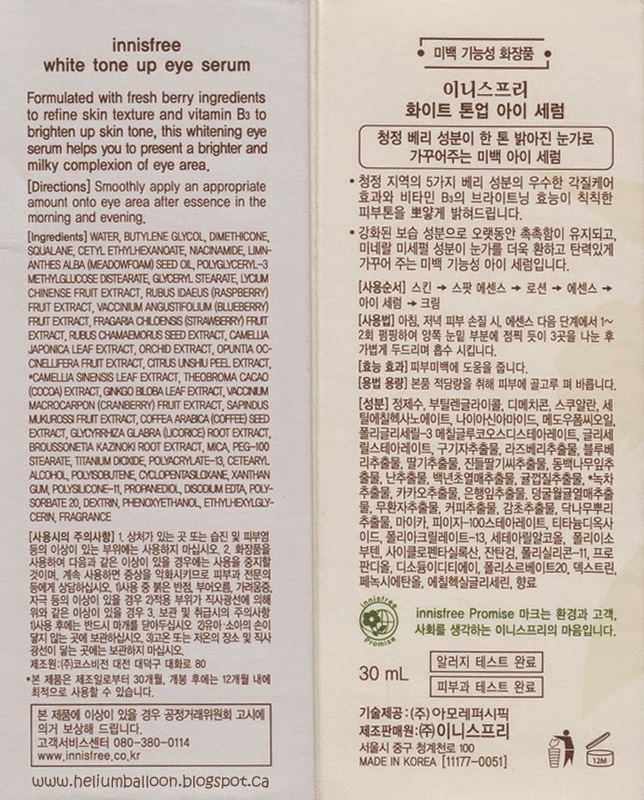 This eye serum contains pure berries extract and green complex, claimed to brighten up the under-eye area. The 30 mL product comes in an off-white plastic tube with a spring-operated bulky pump for $24.45, purchased from w2beauty, reasonable for an eye serum. This pump actually works well with the serum inside bottle because it's slightly thicker. Click to enlarge the photo below for list of ingredients. Scent: I wouldn't say it is scentless, but it's definitely very very faint. Application: spreads easily, lightly massage eye-area for absorption and does not leave stickiness. Effectiveness: This serum provides soothing pampering to the eye area, especially after a fresh shower before sleep. A little goes a long way and one pump is more than enough for one use with gentle massaging. In terms of brightening, it's tough to judge because lifestyle plays a huge factor in my daily variation of dark-eye circles/eye bags. I would be more confident to comment once I get into the working routine in a few days T^T. 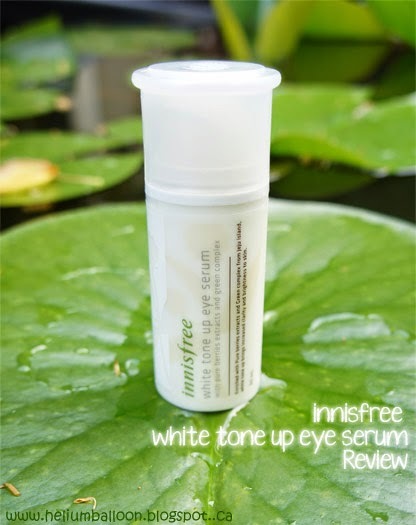 Comments: The innisfree White Tone Up serum is a fairly-priced eye serum product aimed to nourish and brighten up the under eye area. 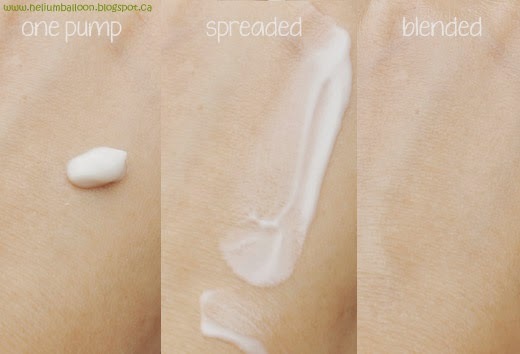 For me, it is a great eye cream that is just the right creamy consistency, provides adequate moisture (especially for drier places) and comes in a hygienic packaging that is light enough to travel around. If you are looking for an affordable daily eye cream, this would be a great choice.